Tiny permalink to this page. This is a PHP class for developers to protect forms from bots. 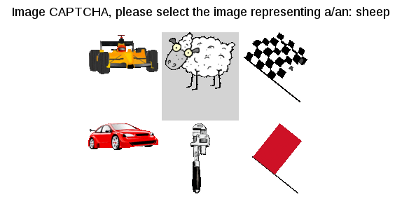 It can create image or text based captchas and comes with a management interface. PHP 5.1+ and strict mode compatible. Here is an example of the class using the same image to ask a different question. This is achieved by tagging the image which creates links between the individual images.Once an image is selected based on a tag (animal or sheep) it will exclude all other images tagged with either animal or sheep. 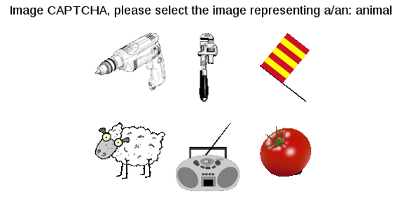 It is also possible to offer a text question/answer based CAPTCHA as a fall back for anybody using a screen reader. 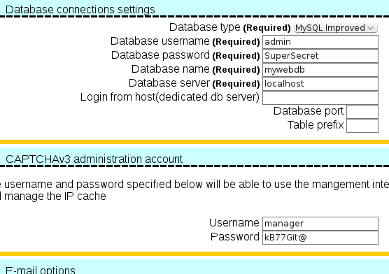 The download comes with example scripts which will only work after you have installed the necessary database tables. Fill out the rest of the form and proceed to the next page. Next download the config file into the include/ directory and finally click the button to setup the tables. captchav3 should now be ready to be used. Try out the examples to verify that everything works.